Dubai, UAE, July 31, 2017: His Royal Highness, Prince, Mansour Bin Megren Bin Abdul Aziz, Deputy Prince of Asir Region, visited Al-Jazeera Paints Corner for Children during his recent tour to Abha Art Street, which is being held as part of “Abha Festival Gathers us”, in support of Abha celebrations with its new title as the capital of Arab tourism for the current year. His Royal Highness, listened to a brief explanation from Mr. Wael Bin Mohammed Bin Abdullah Al- Romaih, Deputy Executive President of Al- Jazeera Paints Company, on the events and activities taking place in Al- Jazeera Paints Children's corner in an atmosphere of fun, smiles and colors to discover new talents and create their creativity, as well as giving the children the opportunity to color their favorite drawings, such as those of figures, numbers, flowers, birds, animals, fruits and vegetables. His Royal Highness, briefed on a number of drawings of the children, expressing his delight and happiness with what he has seen of creative models that foresee the prospects of a promising future in the fine arts. Al- Jazeera paints seeks to strengthen its relationship with children, and considers them the liver of liver, the fruit of hearts, the fuel and the secret of happiness, the source of optimism and the symbol of hope, and therefore it felt that it should contribute to a role in assistance in the process of their upbringing and the formation of their personalities and their independence to be active members of society. For several years, Al-Jazeera paints has produced a healthy cleanable paint for children's rooms (Al- Jazeera Child’s Paint) and launched an online website that interests them kids.al-jazeerapaints.com and embodying the perception of Kadoor and saffora, the two childish and symbolic characters simulating their wishes and aspirations. 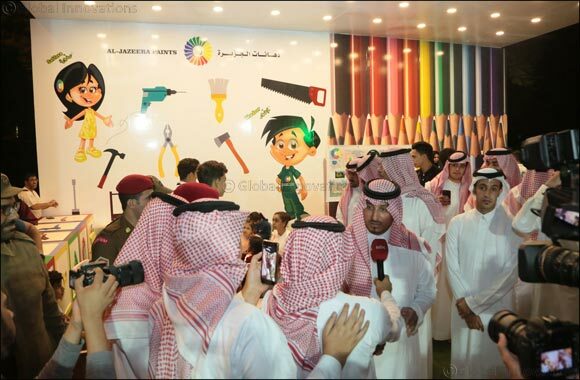 Al- Jazeera Paints has a rich history of supporting and sponsoring programs that encourage the discovery and promotion of artistic talents in the field of fine art, such as the 2016 International Children's Painting Biennial, the 11th Fine Arts Exhibition for gifted children with special needs held in Jeddah last May, a number of courses for the same exhibition, in addition to the program of drawings and creations of children with special needs 'congratulations cards' for the current year 2017, a subsidiary program of the Association of Children with Disabilities on the basis of its social responsibility as a national leader company with concrete efforts and purposeful partnerships for community service and development over the past years.